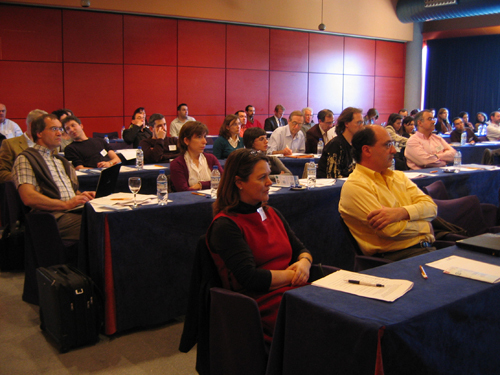 The Partnering Workshop was organized in January 2008 closely connected to the second multinational call of the ERA-NET PathoGenoMics. The nine countries hosting this second joint call named as Applied pathogenomics: Prevention, diagnosis, treatment and monitoring of infectious diseases are Austria, Finland, France, Germany, Hungary, Israel, Portugal, Slovenia and Spain. The workshop offered its participants a forum to meet, to exchange research ideas, to present their expertise and to create contacts. Thus, it supported the formation of transnational research consortia. Altogether 54 researchers representing academia (67 %), industry (20 %) or clinics (13 %) participated the meeting. Most of the participants were from Spain (54 %), France (17 %) and Germany (15 %). The other participants came from Austria, Hungary, Portugal, Finland and Slovenia. The workshop took place in Barcelona, which explains the high proportion of the Spanish participations. The workshop had four sessions consisting of 19 oral presentations. In addition, there were eight poster presentations. The call emphasized the partnership of academia with industry and clinics. The technology transfer issues, like IPR and licensing, were lightened during a special session. Based on the written feedback asked from the participants, the workshop reached its aims in giving support to multinational consortium building.